Fit-Ink: Fit-Q: What's your ideal running temperature? It's fall and it's marathon season. Sometimes that means cool temperatures (we hope) but in recent years, we haven't been so lucky especially when the Bank of America Chicago Marathon hits the Windy City. Remember the year it snowed? It was 1993. How about the year where it was so hot the race was cancelled and runners were encouraged to pull off course? That was the 30th anniversary in 2007, where temperatures soared into the high 80s and it felt like an oven on the city streets. Or when the starting temperatures were at freezing? It was 2009. Or what about last year when it felt like summer? Sure marathons get their fair share of weather extremes--don't remind me about the Grandma's Marathon I ran where it was uncharacteristically warm and the promise of cool air blowing off Lake Superior didn't happen--from rain to sun, wind to still air, cold to hot. And sure the weather can change in an instant. How many times have you looked at the weather forecast only to watch it change again and again before race day? I know I was expecting to see temperatures in the 60s or 70s when I looked at this year's Chicago Marathon forecast--I've simply grown used to it, between the warm races the last two years and not running a chilly race once this season (and I've been racing since March). 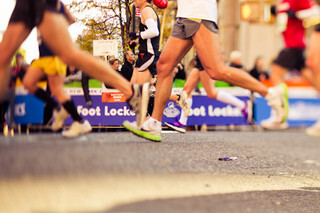 What's your ideal running temperature, marathon or not? Note: Degrees are measured on the Fahrenheit scale. Photo grabbed from lululemon athletica at flickr.